The BBC College of Journalism and POLIS, part of the London School of Economics and London College of Communications, will host a one-day conference next week to discuss how developments in journalism affect the value of the industry. The free event on Friday 11 June will include sessions on future funding models for journalism; how social media and mobile are affecting accuracy and access to journalism; and what role journalism can play in an increasingly digital society. Key speakers include: Peter Horrocks, director of BBC Global News; Jon Snow, presenter of Channel 4 News; Geordie Greig, editor of the Evening Standard; Laura Kuenssberg, chief political correspondent at BBC News; and POLIS director Charlie Beckett. "This is a fantastic opportunity for anyone with an interest in journalism to discuss its real importance in today's world. Some of the finest thinkers from across the whole media landscape, will be debating the true value of journalism in 2010," said the BBC College of Journalism's David Hayward. As part of the programme, Journalism.co.uk will host an afternoon discussion on grassroots journalism, focusing on trends in hyperlocal and community media. Speakers in this session are: Will Perrin, founder of Talk About Local; David Higgerson, head of multimedia for Trinity Mirror Regionals; Mike Rawlins from Pits 'n' Pots; Martin Moore, director of the Media Standards Trust; and Robin Hamman, founder of the St Albans blog and digital director for Edelman. The event is also supported by multimedia journalism collaborative not on the wires, the group behind last year's The Berlin Project, who will be presenting a discussion on innovations in journalism. The current running order for the event is available at this link. Tickets can be reserved online for the conference, which will be held at the London School of Economics. 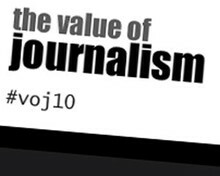 Journalism.co.uk will be reporting on the day's events - to follow on Twitter follow @journalism_live and the hashtag #VOJ10.